The sixth year of funding from the Jerome Foundation provided artists Emily Hoisington, Daniel Luedtke and Anna Tsantir with access to Highpoint’s printmaking facilities as well as technical support, critiques with area artists and art professionals and the chance to work in a studio environment that encourages experimentation and growth. 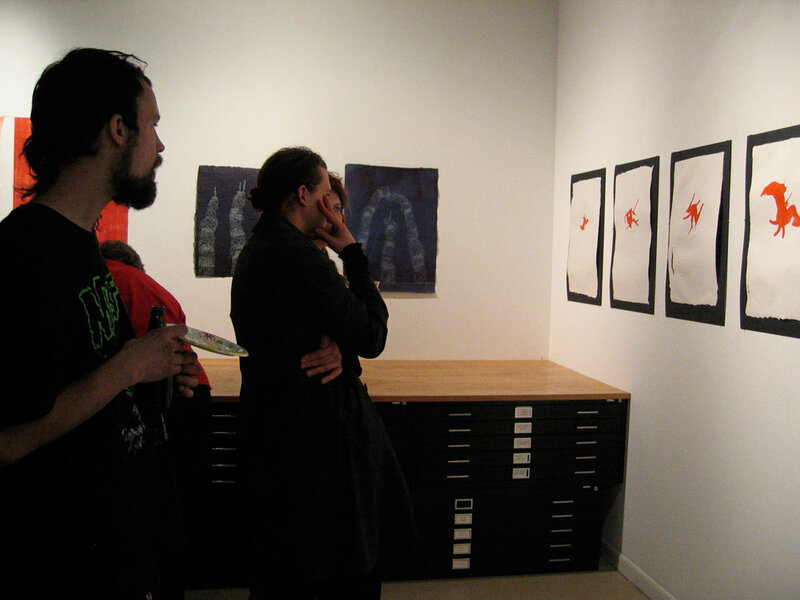 The prints created during the residency were featured in this exhibition. Further information about the artists and their prints can be read below. Anna Tsantir’s current body of work utilizes a “visual lexicon that functions as a cast of characters and settings for a two-dimensional drama.” Polyhedron towers and piles, alphabet ladders and other characters are used to create Tsantir’s nonlinear, visual fairytales. Tsantir has a BA in art history from the University of Minnesota and a BA in art education from the University of Wyoming, Laramie. She also received her MFA in printmaking from the Memphis College of Art. She has participated in group shows at the Minnesota Center for Book Arts, Minneapolis; the Center for Book and Paper Arts, Columbia College, Chicago; Second Floor Contemporary, Memphis; and the Minneapolis Institute of Arts, Minneapolis. Daniel Luedtke’s “bold colors, geometric abstractions and absurdist illustrations within unexpected scenes” express themes of the macabre, the comic and the sexual. A musician and self-taught printmaker, Luedtke’s style builds from the poster art tradition while challenging the medium’s inherent subordinate and promotional roles. Luedtke received his BA in piano performance from Augsburg College. He has participated in exhibits at the Belfry Center for the Arts, Minneapolis; the Soap Factory, Minneapolis; Co-Prosperity Sphere, Chicago; and De Player, Rotterdam. Hoisington has a BA in studio art and art history from Bethel College. She received her MFA from the Minneapolis College of Art and Design with a concentration in printmaking and papermaking. Hoisington has participated in exhibits at the Soap Factory, Minneapolis; the Minneapolis College of Art and Design, Minneapolis; and the Katherine E. Nash Gallery, Minneapolis. Special thanks to this year’s panel of jurors: Ken Bloom, Director, Tweed Museum of Art; Sally Johnson, Director, Groveland Gallery; and Carolyn Swiszcz, Artist.